These small and silent embedded PCs come with m0n0wall version 1.8.1 (or later) pre-installed on the ATA Disk-On-Module (Flash / SSD). They were built from refurbished thin client computers. They are fully tested and are guaranteed to be in full working condition. They come with everything needed to be up and running as a m0n0wall Firewall/Router (including ac adapter). You will need to setup the initial IP address by hooking up a keyboard and monitor. After that you can configure everything remotely using the included web administration utility. (for samples of configuration see the m0n0wall screenshots/documentation linked to below). I have personally been using one of these network appliances (as my only firewall/router) without a problem for the last 6-7 years now. I used to have to reboot my Linksys router every couple of weeks due to it hanging or crashing. When I switching to one of these units I have not once had to reboot (the router). In fact my m0n0wall router hasn't been off since the last time I lost power (several months ago). These are REALLY SILENT PCs. Except for the power LED, I wouldn't be able to tell when they are on. These are POWER EFFICIENT PCs. Using a watt-meter, I measured the power at the wall at about 15-20 watts! These units are complete Single Board Computers, and can be re-configured with several different operating systems including MANY specialized Linux/FreeBSD Distros. You can also download an image of Windows XP Embedded from HP's website (you would need a larger flash disk). 800 MHz VIA Eden C3 (x86) processor with PASSIVE HEATINK Fanless! 256 MB RAM, (upgrade-able to 1 GB). 2x (Dual) 10/100 NIC (LAN/WAN), RJ-45. Additional LAN or WIFI ports are available through the PCI slot or USB adapters. 32 MB (or larger) ATA Disk-On-Module flashed with the latest m0n0wall firmware (currently 1.8.1). 1x 44 pin IDE connector (supports 2 IDE devices, currently housing the ata disk-on-module). 1 PCI slot (currently housing the 2nd 10/100 NIC). 2x USB 1.1 (add a USB NIC or WIFI adapter). 2x Serial ports (console support). PS/2 Keyboard and Mouse (console support). 11.375" (W) x 9.0" (D) x 2.125 (H) (About the size of a text-book). 6 lbs 2.5 oz. Pre-loaded with the latest version of the open source m0n0wall project (1.8.1 or later) (See below for details). NOTE Upgrade quantities may be limited, so make sure and send a message to me to ensure I have stock on hand. Provides many of the features of expensive commercial firewalls, including. Serial console interface for recovery. Wireless support (access point with PRISM-II/2.5/3 cards, BSS/IBSS with other cards including Cisco). DHCP client, PPPoE, PPTP and Telstra BigPond Cable support on the WAN interface. IPsec VPN tunnels (IKE; with support for hardware crypto cards, mobile clients and certificates). PPTP VPN (with RADIUS server support). DynDNS client and RFC 2136 DNS updater. 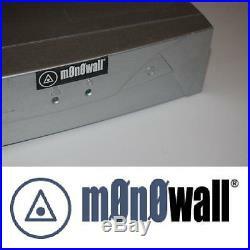 The item "M0n0wall (monowall) 800MHz Router / Firewall VPN, VLAN" is in sale since Monday, February 22, 2010. This item is in the category "Computers/Tablets & Networking\Enterprise Networking, Servers\Firewall & VPN Devices". The seller is "serisman" and is located in Libertyville, Illinois. This item can be shipped to United States, Canada, United Kingdom, Denmark, Romania, Slovakia, Bulgaria, Czech republic, Finland, Hungary, Latvia, Lithuania, Malta, Estonia, Australia, Greece, Portugal, Cyprus, Slovenia, Japan, China, Sweden, South Korea, Belgium, France, Hong Kong, Ireland, Netherlands, Poland, Spain, Italy, Germany, Austria, Israel, New Zealand, Philippines, Singapore, Switzerland, Norway, Croatia.